Adam Kolker is a contrarian. In a world of tenor saxophone players who shout, he often whispers. His measured voice and the purity of his tenor sound do not detract from his relevance and modernity. In fact, his relative quietude makes it easier to perceive the freshness of his ideas about lyricism. Kolker plays all the single-reed instruments, and on an earlier recording (2008’s Flag Day) he overdubbed himself on flutes and clarinets and created a background woodwind choir. On Beckon, on three tracks, he supplements his core trio (guitarist Steve Cardenas, drummer Billy Mintz) with an actual live woodwind section (Lawrence Feldman, flutes; David Gould, clarinets; Jackie Henderson, bassoon). Kolker’s compositions for expanded ensemble are as formal and meticulous as fugues. “Slow Dance” is an enigmatic three-note motif, obsessively repeated by the woodwinds. Major and minor tonalities become depths of haunting harmony, from which Kolker’s veering jazz solo emerges. “Cycles” is advanced chamber jazz, but its precise execution of complexity is secondary to rich reed sonorities and Kolker’s surges of feeling made into spontaneous melody. On the title track, the woodwinds flow all around Kolker and Cardenas, who, individually and together, offer stimulating abstractions that eventually link to the song. One complaint: Kolker is a special interpreter of standards. There should have been more than one. “I Wish I Knew,” loosely, dreamily sketched, is sublime. 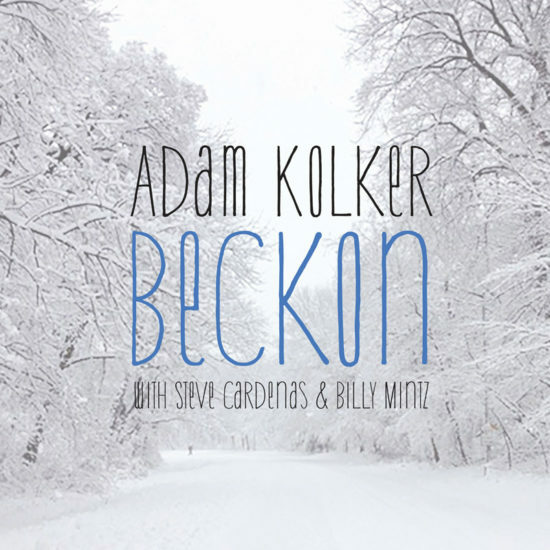 Preview, buy or download songs from the album Beckon by Adam Kolker on iTunes.